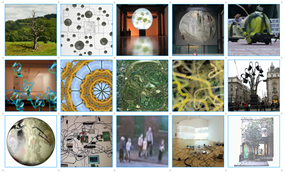 A day of presentations, participatory workshops and informal performance around themes of urban sound, networked sound, locative media and acoustic ecology – the relationship between living beings and their environment, as mediated by sound. Featuring Furtherfield (Ruth Catlow and Marc Garrett), and guest speakers Stanza, Peter Cusack, Ximena Alarcón and Pedro Rebelo. The event is free, and open to anyone interested, including musicians, artists, curators, technologists; ecologically inclined thinkers, makers and doers of all kinds. BOOKING IS ESSENTIAL. Space is limited. Reserve your place. What to bring: Bring headphones to take part in the VisitorsStudio workshop. Wear comfortable (and quiet!) clothing and shoes for the soundwalk, and be prepared for rain. We hope to offer wireless access. If you wish to have wireless access you MUST email in advance your name, computer model and MAC address to Katharine Norman at Katharine.norman [at] city.ac.uk by 7 November 2009.